Why is muscle glycogen important for meat quality? The following explanation is provided courtesy of the NSW Department of Primary Industries. The term 'Dark Cutting' is used for meat that does not bloom or brighten when it is cut and exposed to air. Beef customers prefer beef cuts to be a bright pinkish colour at retail; they avoid dark coloured meat. Dark cutting beef (DCB) is largely linked with stress and the mobilisation of muscle glycogen—energy store—in the live animal prior to slaughter. In the time between slaughter and chilling, a chemical reaction known as glycolysis occurs in the muscle tissue. This reaction converts glycogen into lactic acid. This lactic acid causes the meat pH to decline from the neutral value of 7.2 found in the live animal. The amount of pH fall is determined by the quantity of glycogen available in the muscle for conversion to lactic acid. In the picture below, there are two Scotch fillets. 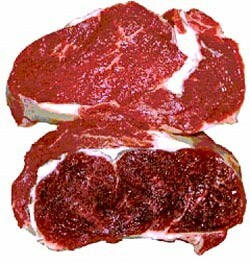 Acceptable meat quality is show in the top steak while the bottom steak is an example of a ‘dark cutter’. Desirable eating table beef has an ultimate pH in the range of 5.3 to 5.7. If the quantity of glycogen in the muscle tissue was low, and the pH remains above 5.8, then DCB is a likely outcome. severe weather conditions during transport. All these factors have been found to decrease the levels of muscle glycogen in the live animal. What was done on Old Man Plains Research Station? Those factors that are known to decrease muscle glycogen were considered for a trial with 97 steers on Old Man Plains Research Station (OMP) in 2015. These steers were grazed on mixed arid rangelands and weighed every time they walked out of the water-yard, using walk-over-weighing (WOW) technology (Precision Pastoral Pty Ltd) (Figure 1A). The average daily rate of liveweight gain for each steer was calculated with regression modelling of the recorded WOW data.The steers were transported 1590 km in 20 hours by B-double road-trains (Figure 1B), direct to an abattoir for processing at Murray Bridge, South Australia. In addition to collection of standard abattoir feedback data, the longissimus thoracis muscle of each carcass was sampled to analyse for glycogen and lactic acid. Those steers that put on weight more quickly had more muscle glycogen in the beef carcass (at slaughter) (Figure 2A). Steers with more rib fat cover at slaughter also had more muscle glycogen (Figure 2B). This supports the theory that the better the energy intake of cattle, the more muscle glycogen at slaughter and therefore better meat quality with lower risk of dark cutting beef. What difference does breed make to muscle glycogen at slaughter? Because the OMP trial steer records were grouped under three genetic types, we could ask a question about breed and muscle glycogen. The steers weighed 520 to 720 kg liveweight at 27 to 30 months old (50 days before trucking) and were classified as Droughtmaster (100%Dm), Droughtmaster-cross (50%Dm) and Droughtmaster-infused with 55-65% Brahman content (25%Dm). Compared to the 100%Dm group, steers in the 25%Dm group had a heavier carcass weight (on average 14 +/- 13(se) kg higher), which is consistent with their higher average frame size. Muscle glycogen was significantly lower in the 25%Dm group (Figure 3A), and muscle glycogen also tended to be lower for the heavier carcasses (Figure 3B). This negative correlation between muscle glycogen and carcass weight was unexpected. The conventional understanding is that increasing carcass weight is associated with higher levels of muscle glycogen and reduced incidence of dark cutting. It is speculated that in the 25%Dm steers, the high Brahman content, heavier body size and higher frame size were three confounding factors that may have been related to either less glycogen storage during growth, higher maintenance requirements, or increased use of glycogen stores in transit. Overall the study findings showed that the faster-grown and fatter steers had higher levels of muscle glycogen at slaughter—this is consistent with previous research (1, 2). Study findings also showed that deposition of glycogen in the muscle may differ slightly between cattle of different genotypes. In extensive-grazing situations, walk-over-weighing technology and data-modelling have been shown to be useful tools to identify steers with a low rate of pre-trucking liveweight gain. Ongoing work by the Northern Territory Department of Primary Industry and Resources aims to continue identifying tools to address pre-trucking issues for meat quality of steers from Central Australia. Gardner GE, McGilchrist P, Pethick DW (2014) Animal Production Science 54, pp.1575-1583. McGilchrist P, Alston CL, Gardner GE, Thomson KL, Pethick, DW (2012) Meat Science 92 (4), pp.474-480.